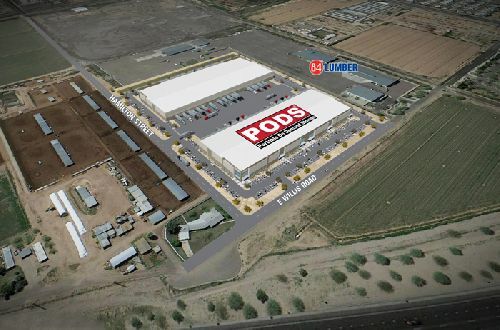 PODS® Moving and Storage is about to take occupany of a 106k sf, build-to-suit facility just completed in February at AZ 202 Commerce Center in Chandler, AZ. PODS purchased the land, just off the Arizona Loop 202 Fwy, in 2017 from ViaWest Group for $2.15 mil. ViaWest Group developed the building, with Alexander Building Company as the general contractor. ViaWest and Alexander have formed a company, Konstruct Design˖Build for office, industrial and retail build-to-suits. The facility includes 103.6k sf of warehouse space, with the remaining 2.4k sf as office. The interior clear height, for stacking, is 28’. Based on the construction set of architectural floorplan data, there is a capacity for approximately 1,600 PODS on the interior of the warehouse which equates to 553 PODS stacked up to three high. There is an additional capacity on the exterior of the back of the building with 42’ screen walls to allow stacking of up to four PODS high. The facility also includes three offices with a fourth room reserved for either office or conference room space. PODS selected this parcel right off the Arizona Loop 202 Freeway in Chandler, Ariz. for its visibility and freeway access. The firm is relocting their current location in Mesa, AZ. The new location puts them approximately one-fourth of a mile off the freeway, granting fast access to most of the southeast Metro Phoenix area. This is a great complement to the PODS warehouse location on the west side of Phoenix in Tolleson, AZ. Mike Haenel, Andy Markham, Will Strong and Phil Haenel of Cushman & Wakefield brokered the transaction on behalf of ViaWest Group. Aric Adams of Kidder Matthews repped PODS. ViaWest Group, one of the fastest growing real estate investment companies in the Valley with over $800 million in acquisitions, has retained Cushman & Wakefield to develop the remaining seven-acre lot. The total building area can accommodate a 134k sf build-to-suit for an owner/user.